UPDATE November 2, 2010 - Partly as a result of the buzz generated by this ebook release yesterday morning, over the past 24 hours, my new book Real-Time Marketing & PR has ranked between #6 and #22 overall of all the millions of books books sold by Amazon.com. Thank you to all who purchased a copy. In a new free ebook releasing today, I describe my research of the Fortune 100. Interestingly, the Fortune 100 companies that engage in real-time communications beat the S&P 500 stock index on average while the companies that do not communicate at speed underperformed. 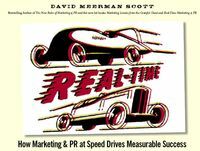 Download Real-Time: How Marketing & PR at Speed Drives Measurable Success now. 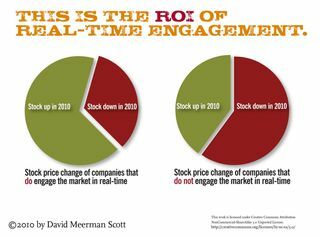 In my research, I contacted the communications departments of the Fortune 100 companies and found that only 28 percent engaged with me in real-time. Many of those 28 companies have comprehensive real-time communications programs in place, which I describe in the ebook. What is the ROI of real-time communications? My research is an attempt to answer a simple question: How much of an effect does real-time communications have on the performance of companies? Watch an interview of me talking about the research. Comparing the closing stock price of each Fortune 100 company on December 31, 2009 through closing prices on September 3, 2010 (when my book manuscript was due to my publisher - John Wiley & Sons), I found that the stock prices of 67% of companies that operate in real-time were up, while only 42% of those that do not were up in 2010 year-to-date. In the ebook I provide much more information from the research including those companies that responded with helpful and relevant responses, such as State Farm Insurance and Boeing, the companies that did not respond at all, such as Wal-Mart and Exxon Mobil, and those that simply sent automatic, canned auto-responses with irrelevant information, such as Massachusetts Mutual Life Insurance and Walgreens. Portions of this new ebook appear in my brand new hardcover book, Real-Time Marketing & PR: How to Instantly Engage Your Market, Connect with Consumers, and Create Products that Grow Your Business Now, which is released by Wiley today.